Web Control Center allows you to download (export offline) scenes from a studio's Harmony database and work on them locally from a remote location. When downloading the scene, you have the option to check it out so it's locked; this prevents other users from modifying your scene while you are working on it. When you are finished working on your scene, you can upload (import) it, merging it back into the Harmony database. When downloading a scene, the data is first placed in the user's exchange folder where it can then be downloaded on the user's remote computer. The exchange folder is located in the USA_DB directory of the Harmony database. This folder contains individual folders for each user; this is where uploaded and downloaded scenes are stored. You can download scenes individually or in bulk. NOTE: When working on local scenes, do not change the folder names or structures as it will cause problems when reimporting scenes. When you no longer need the stored packages in the exchange folder, delete them to keep your storage space organized. You can view all operations and error messages related to these processes in the Log view. If you want to upload environments, jobs and scenes for archiving, you must use the Control Center. Web Control Center only allows you to upload and download scenes for exchange between studios and freelancers. NOTE: Scenes cannot be uploaded or downloaded using a tablet. Zip (compress) your package. It should have the exact same structure and internal naming as the package you downloaded. In Web Control Center, select Admin > Import. Click Add Another File to your Exchange to upload your zip file. 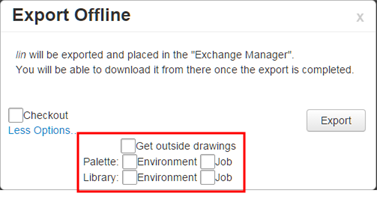 NOTE: You can also import your zipped packaged through the Exchange Manager by selecting File > Manage Uploaded/Exported Files. In the Exchange Manager, click Select Zip File to Upload. Once the package is imported, go to the Import page to push it back to the Harmony database. Select Admin > Import. Click Import to import your package. You can export offline many scenes in one package but when you reimport them, each scene must be in its own individual zip package. However, if you export/import to database, you can do multiple scenes at the import. Once the package is imported, the package details disappear. Select the Checkin option to check your scene back into the Harmony database and allow other users to modify it. Click Quick Import to import your scenes using the preset options. Click Import with Options to import your scenes with custom options—see Import or Export to Another Database Options. NOTE: If you are trying to import a scene that was checked out by another user, you will not be able to complete the operation. A warning message will be prompted. In the Exchange Manager, click the Refresh List button. The Log view opens. Green messages indicate successful operations, orange indicates warnings, and red messages are errors or failed operations. 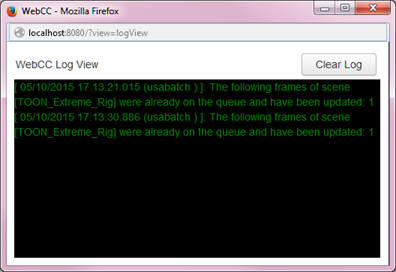 To clear all messages from the Log view, click Clear Log.